Yes, that first Suzuki recording is plain and boring. I wouldn't trust that he could do a much better job now. Yes, Suzuki's second set is actually a much better job, performance and sound wise. Haven't heard this one, Q. The clip sounds interesting, though. Lots of color. His touch is light and feathery yet there's a strong sense of rhythm - like he's dancing on the fingerboard. I'd pull the trigger but I know I don't need a third set...right?? This is a remarkable and very individual interpretation. It is indeed dancing, with generally fast tempi and rhythmic energy even in the Sarabande´s, and Cocset plays with astonishing elegance and virtuosity. Miking is close, you can hear the noise from the left hand clearly, but this is not annoying at all, on the contrary it adds to the feeling of presence. The sound is dark and soft - almost seducing, and sometimes the instrument sounds more like a bass viola da gamba than like a a violoncello. Recommended without reservation. I thought I'd listen to this a few times before posting my impressions. But I'd don't think that is necessary - it's all crystal clear. I totally agree with all the things Premont said about this recording before. It's elegant and seducing indeed. It is dancing but in a elegant, flowing way - Donwyn, I think this one will definitely be to your taste! Compared with Beschi, this is less "gruff" and inward looking. If Paolo Beschi's rendition is dark shining wood, Cocset's is lush velvet. In fact, I imagine the soft edged sound and the interpretation might well appeal to those new to HIP in these pieces. More than any other HIP recording. Cocset uses no less than four different instruments, all made by Charles Riché after originals by Gasparo da Salo, Guarneri, Stradivari and Amati. I was a bit apprehensive on that, but that was unfounded: the subtle differences between the instruments enhance the variety between the suites. The instrument have mostly a dark, deep and "lush" sound - more "soft" (the Da Salo), a more dark wooden sound (the Guarneri), more fresh and "open" (Stradivari). The recordings were made in a church but sound very natural and open, not overtly spacious or reverberant at all. One caveat: As Premont mentioned, (at times) the action of left hand on the fingerboard can be heard clearly - the strings producing a soft "plopping" sound when released again. Like him, I don't mind this at all, but that is up to personal taste. One very sour buyer posted a two star review on Amazon just because of this... Well, that's his loss. Yet another superb HIP recording, and after Beschi this recording by Cocset confirms to me that the interpretation of Bach's cello suites has entered a new stage. This is outstanding and IMO on par with Anner Bijlsma (Sony) and Paolo Beschi (Winter & Winter). It's elegant and seducing indeed. It is dancing but in a elegant, flowing way - Donwyn, I think this one will definitely be to your taste! Que, thanks for that description. It does indeed sound right up my alley! I will definitely investigate! Good thing Christmas is just around the corner! I need all the gift cards I can get just to keep up with this board! It's a cup of Keemun tea, of course. HERE is the link to the pre-existing thread on Bach's Cello Suites. This is one of the few piece I have enjoyed seeking out multiple copies of (though all but one have been lost now ). My personal favourite composition *ever*! Casals is of course indispensible-- Naxos' remastering is excellent. My first purchase of all six suites was the last Janos Starker recording (done in the late 90s? 2000?). His seems very "heavy" to me (which is not necessarily a bad thing). He does seem to struggle a bit on No. 6. My personal favourite is the badly titled "Inspired by Bach" album by Yo-Yo Ma, which I prefer over his original recording from the 80s. He's got a lighter & grace ful touch-- the way he handles the gavotte of No. 6 sounds like dancing two inches off the ground. Fortunately I still have the Yo-Yo Ma, but I'd like to buy them all back and build on it more. I never tire of the cello suites and I love all the different interpretations. I'll be interest to hear other people's responses as well, to compile a list for myself. 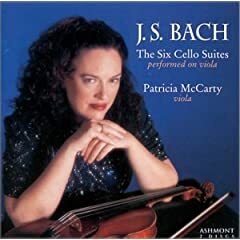 Normally I am satisfied with just one recording of a composition, as long as its reasonably well-done (I simply cannot afford to buy more), but the Bach's cello suites are one luxury I have allowed myself. p.s. oh, I see Keemun's link now! Casals, Casals, Casals...insight, insight, insight! I have Starker too. I've never found him a convincing or engaging soloist though. On viola-- just ordered it. Well, that's what makes horse races. Me, I love Starker. And as for his soloist credentials and ability to engage the listener, I'd recommend almost any of his works from his time with the Period (LP) label, especially his Kodaly solo cello sonata and (w/ Eidus) the duo for violin & cello. Utterly stunning. Keep in mind, however, that he's done the Bach solo suites at least three times, possibly four. I have the first (well, I think it's the first) on EMI (good straightforward take) as well as the second, more famous traversal on Mercury (my favorite--gutsy, powerful playing and excellent recording). Seems to me that he did a set that was originally released on Sefel or Denon or some such early-digital label in the late '70s or in the '80s, and I see that there's a set on RCA now that's ostensibly from 1997. I do NOT have the later ones because on brief audition of his third round many years ago, I did not care for him in that particular performance--so if either of the last two are the basis for your judgment, we may be more in accord than I'm assuming. Starker (Mercury) for power and intensity. Fournier for beauty and elegance. Casals for real depth (but not great sonics...these ARE historic). I am familiar with Ma, Harnoncourt and Rostropovich, as well, but less enthusiastic about their renditions than for my top three. Keep in mind, though, that I have NOT heard Tortelier, who was once very highly regarded in these works, nor more than a sampling of Wispelway (who I do like, in general). I have Bylsma for the 1027-1029, but not for the solo suites. Any comment on specifics of approach or performance? Anybody heard Ralph Kirschbaum? It's something like $12 for his cello suites and somebody else's complete violin sonatas and partitas. The first three performed by the same can be found on a Verita2x reissue. Nigel North on Linn similarly has done these. For modern instruments, I have both of Yo-Yo Ma's recordings (1982 and 1998). For period instruments, I have Anner Bylsma and Paolo Beschi. Of all these, I think I like Yo-Yo Ma's 1982 recording the best, but I'm still going through the rest. On my wishlist are Casals, Fournier, Starker (RCA and Mercury), Tortelier, Schiff, Rostropovich and Isserlis. Staying with period instrument renditions with something different to offer, these are very interesting performances in their own right. Baroque violinist Dimitry Badiarov argues that the Bach suites were originally composed for a Violoncello piccolo da spalla - the picture shows him playing one of his own reconstruction. [Music] washes away the dust of everyday life. Kirschbaum is my favorite, followed by Fournier, then Schiff, then Casals, then everyone else congregating way below, including Blysma, Rostropovich, Ma, Wispelwey, and Starker. To me, Casals, with his eloquence will always be a reference in this works. Regarding other recordings, I prefer the elegance of Bylsma (SONY). Fournier (DG) seems to me too rhetoric but he is as always very impressive. The Japanese releases are often the most difficult to get hold of. I wonder, if it ever will become available in my country, and if I have to purchase a SA-CD player, or whether it will become released in a hybrid version.